MAJOR GENERAL THOMAS S. JEFFREY JR.
Major General Thomas Stanley Jeffrey Jr. was born in Arvonia, Virginia, in 1917. He graduated from Arvonia High School, in 1934 and graduated from Virginia Military Institute in 1938 with a bachelor of science degree in electrical engineering and a reserve commission in the Field Artillery. Immediately upon graduation from the Virginia Military Institute, General Jeffrey entered flying school at Randolph Field, Texas, as an aviation cadet, where he received his pilot wings in 1939 after having completed the bombardment course. His first assignment after Kelly Field was Langley Field, Virginia, and after a few months he was transferred with a new unit to Puerto Rico. He participated in reconnaissance and mapping of many areas of Central and South America. 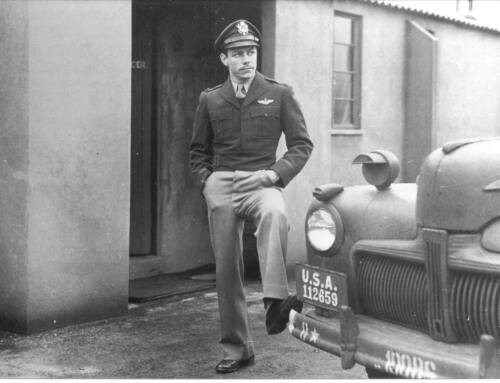 General Jeffrey returned to the United States in 1942 and was assigned as squadron commander with the 34th Bombardment Group at Spokane, Wash. When the 390th Bombardment Group was activated at Blythe, Calif., he was assigned to the group. He led the 390th Group to England in 1943 and remained with it as deputy commander until May 1944. In May 1944 he was assigned to the 100th Bombardment Group as commanding officer where he remained in this capacity until just prior to the end of the war in Europe. During his tour in Europe, General Jeffrey flew 27 missions in B-17s and was awarded the Silver Star, Distinguished Flying Cross with four oak leaf clusters, Bronze Star Medal, Air Medal with three oak leaf clusters, Army Commendation Medal with oak leaf cluster, French Croix de Guerre and Polish Cross of Valor. He participated in the famous Schweinfurt bombing raid in October 1943 and the shuttle bombing missions to Russia. Just prior to the end of World War II, General Jeffrey was assigned as deputy director of operations of U.S. Strategic Air Force in Paris and later as director of operations of U.S. Air Forces in Europe when the Headquarters moved to Wiesbaden, Germany. Upon return to the United States in 1946, General Jeffrey went to Barksdale Field, Louisiana, as deputy director of operations for the Air Training Command and director of training aids requirements for the U.S. Air Force. He remained in this capacity with duty at Barksdale and Chanute Air Force Base, Illinois, until 1950. During the period of 1950 - 1954, General Jeffrey was director of operations for the 47th Air Division, Walker Air Force Base, New Mexico, for two years; chief of Strategic Weapons System Development, Air Research and Development Command, for one year; and attended the Air War College. General Jeffrey next was assigned to the Pentagon where he served for three years as chief of development for the Armed Forces Special Weapons Project. In 1958 he joined joint Task Force-7 with Headquarters at Arlington Hall, Va., and acted as director of operations and chief of staff of that organization for two years during which time he planned and participated in the atomic tests series in the Pacific area in 1958. In August 1959, General Jeffrey went to the Industrial College of the Armed Forces at Fort McNair, D.C. He was selected as Site Activation Task Force commander of an ATLAS E Squadron located in the area around Spokane, Wash. In this capacity he was responsible for construction, missile installation, test and check of the squadron. He was awarded the Legion of Merit and was named Military Man of the Year in Spokane. When the squadron was operational, he was assigned as Site Activation Task Force commander of a Minuteman missile wing at Minot Air Force Base, North Dakota, with the same responsibilities. In June 1964 General Jeffrey was transferred to Wright-Patterson Air Force Base, Ohio and served as assistant to the commander, and later as deputy for systems management, Headquarters Aeronautical Systems Division and in June 1966 was appointed vice commander, ASD. In October 1966 he was assigned to the Office of the Secretary of Defense (Installations and Logistics) as staff director for aircraft. In June 1967, he was appointed as director of production and programming, Deputy Chief of Staff, Systems and Logistics, Headquarters U.S. Air Force. The General died in Arlington, Virginia, on 14 March 2008. He will be buried with full military honors in Arlington National Cemetery on 22 April 2008.